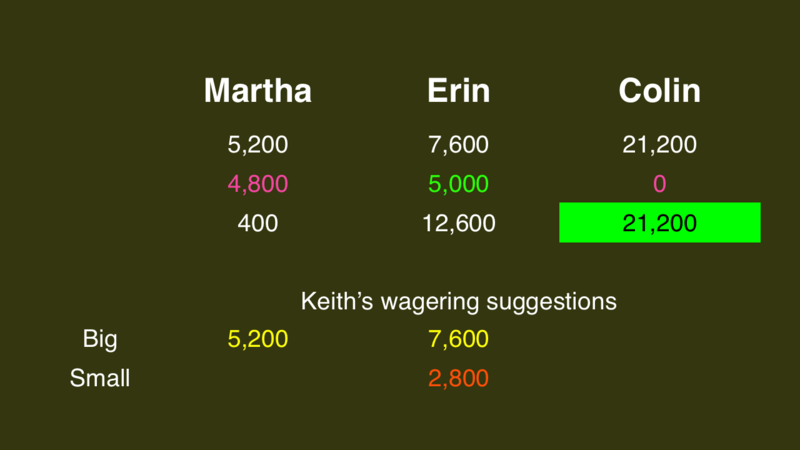 Tonight, I have some serious criticism – and some praise – for the Jeopardy! writing staff. For one, how many of Erin’s fifth-graders are going to ask her what “no strings attached” means? There’s really no need to force that conversation upon teachers when you know dozens of their students will be watching. Speaking of strings, Colin pulled a lot of them tonight, and he’s on his way to the semifinals. Earlier today I posted an analysis of the wild-card system and suggested it is unfair. Mainly, it forces a lot of contestants to gamble the farm on a random category; some of these players will get lucky with an easy clue. Perhaps that’s just part of the game. I welcome your thoughts.  Here’s another way to think of probabilities: by comparing your score with the scores of all non-winners in the past ten seasons, and aiming for at least the 60th percentile.  Erin and Martha are both far below this spot; in fact, their scores would have been good for a wild-card in just 2-3 of the last 34 tournaments. 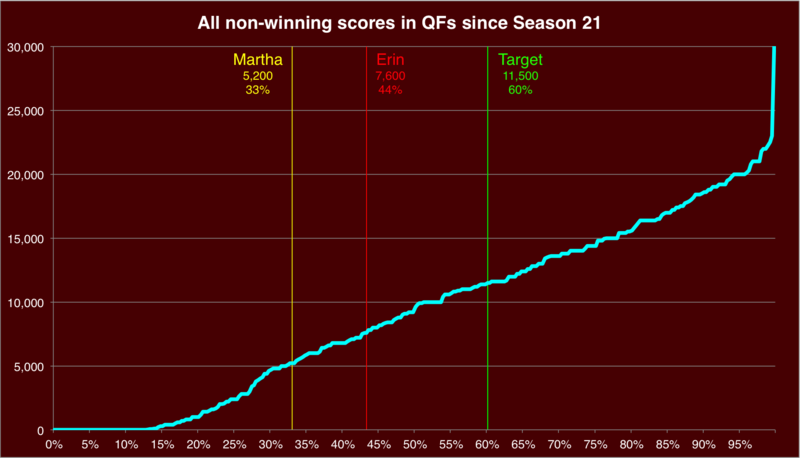 Erin leapfrogs ahead of the target, placing herself in the 66th percentile. I give her a 73% chance of making the semifinals. Martha, unfortunately, is at 0.4%, but it’s better than nothing – and she should take pride in having made big, aggressive wagers throughout the game. 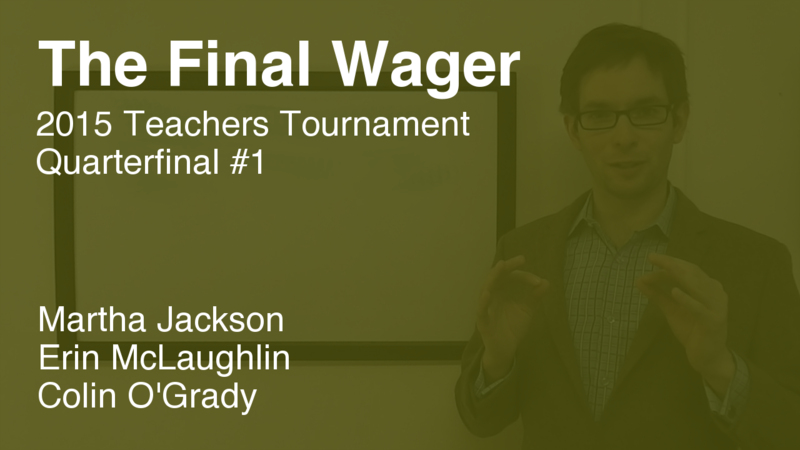 In my video, I explain why this is what I call a “Jeopardy!” Final Jeopardy!. That discussion starts at 2:22, if you want to skip to it. I agree with everything about being a Jeopardy final Jeopardy – this was really easy! I really liked the 3 Musketeers final from last week, which was perfect in this indirect sense too. I got that one easily too. OMG, that’s twice recently now we’ve had the exact same thoughts on something! Either I’m becoming more like you (and I can *finally* stop worrying about making my wager (one of these days)) or you’re becoming more like me, to which I’d suggest you seek immediate medical attention. And what thought might that have been, hmm? No, you cannot if you send a letter the staff will not view it or accept the ideas.